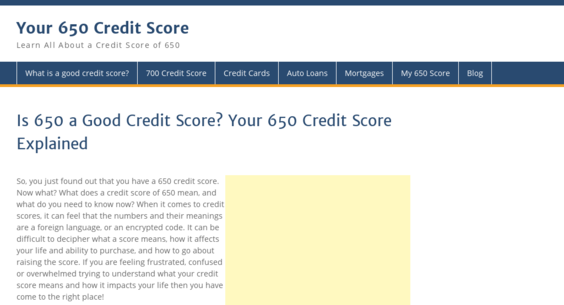 Your650Score.Com — Website Sold on Flippa: 3 y/o AdSense Credit/Finance website w/ Huge Potential! Over $35,000 in Revenue! 3 y/o AdSense Credit/Finance website w/ Huge Potential! Over $35,000 in Revenue! 3 y/o AdSense website w/ Huge Potential! Over $35,000 in revenue over 3-years w/ virtually no maintenance required. AdSense ($30,181), Commission Junction ($4,399), Rakuten ($713). Automated earnings!